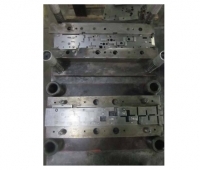 One of the most commonly used tool in the field of hydraulics, mechanical as well as pneumatic pressing is Press tools which is generally used to produce highly voluminous components for various industries. We, at Presswell Tools and Components, being leading Manufacturers, Suppliers (India) of extensive variety of tools and its components, offer an extensive diversity of press tools to serve the distinctive needs of various industries. With our inception in the year 2004, we have served distinctive requirements of tools as well as components in the automobile industry. Our well established and well equipped manufacturing unit at Faridabad and Gujarat ensures effective manufacturing of press tools for the automobile industry to enhance the level of production. Moreover, we are also capable of delivering finest quality services to nearby locations like Noida, Gurgaon, Ahmedabad, Chhatral city and many more. We have been able to progressively grow in the field of manufacturing as well as supplying finest quality press tools for the industry with the help of ours entirely dedicated professional team which distinctively acts as our major supportive pillar in our growth. All our press tools distinctively match up with the significant quality standards set by the industry. Not only this, we have also acquired the distinctive certification of IATF 16949 which is significant mark of uncompromised quality in all our products. Fulfill all your customized requirements with our diversified range of products.